Here you will find everything Chihuahua. From health tips to advice. Food to toys. Clothes to fun facts. Places to eat and stay. Follow Lucy’s life and adventures too. I am Lucy. I’m a Chihuahua expert because I am a Chihuahua. I have been my whole life. 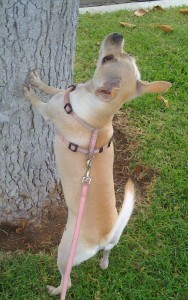 I hope to help Chihuahuas be the best they can be by teaching their human companions who to be great Chihuahua people. Now I need to catch a power nap before it’s snack or walkie time.